Greetings everyone, and welcome back to our Discipline series. Last time, we touched upon Freestyle’s Jetsprint. Today, we are returning to the asphalt playground and the Street Racing Family for some sideways action. Yes, that right: it’s time to discover the Drift Discipline! Drifting was first popularised in Japan, and over recent years has spread across the globe and captivated spectators and drivers alike, from grass root events to international championships. In order to perform exceptionally well, you must remember these four points: speed, angle, line and of course showmanship. 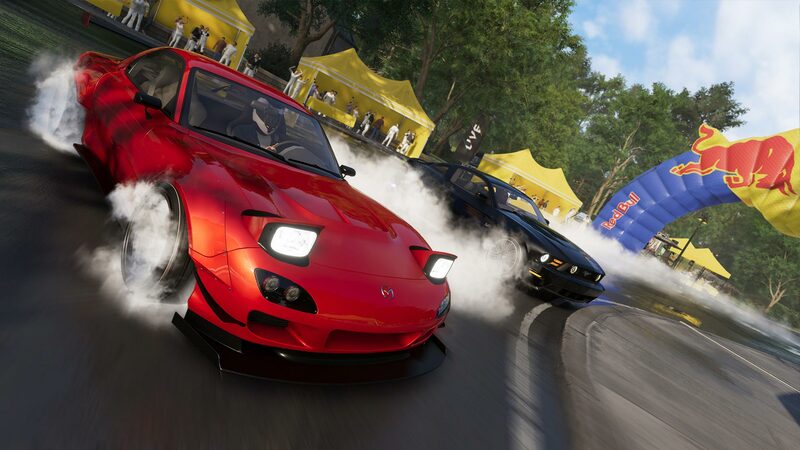 While climbing the ladder to fame in the Drift Discipline, you will have to master sinuous roads, circuits and open areas as you precisely navigate your way through a series of challenging corners. Continuous drifting will generate points, and the longer you can maintain it the more your multipliers will stack. As soon as your drift ends, so does the stacking. In certain events, directional panels will be placed along the track to provide you with a much more challenging experience. To keep things interesting (no one likes an easy ride!) your multiplier will be cancelled if you hit them, and likewise for any environmental collisions. Collisions with other racers will be switched off, however, so the road itself remains yours to play with. And what a playground it is! With tracks in locations from Central Park to deserted docklands, you’ll be discovering the whole open-world USA from a side-on view! That about wraps things up for this Discipline. Stay tuned for the next instalment, and see you next time! For more information on The Crew 2, watch the official announcement trailer and look for more details here! Join the The Crew community on the forums and Reddit, and sign up for our Beta here to try our new Disciplines out for yourself!